Celebrate St Patrick’s Day in Savannah! Celebrating a holiday in Savannah is always a fantastic idea! Whether it is Christmas or Columbus Day, enjoying the holiday in southern style is always a memorable experience. This year, we, here at President’s Quarters’ Inn, suggest that you and your family celebrate St Patrick’s Day in Savannah! You may wonder why you should! Let us tell you about a few fun things that the city does to celebrate this holiday! 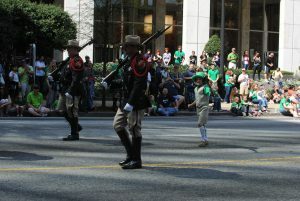 The number one reason to spend this St Patrick’s Day in Savannah is the Parade. Held rain or shine, the St. Patrick’s Day Parade is a wonderful event filled with exciting and thrilling events. The 191st St. Patrick’s Day Parade in Savannah will take place on Tuesday, March 17th. The event begins at 10:15 A.M. on the dot. Check out the parade’s map here so you can decide where you want to sit and enjoy the festivities. Make the holiday into a weekend long celebration, starting with the Irish Heritage Dance on Friday, March 13th. The event is held in the Alee Temple and begins at 8:00 P.M. On Saturday, enjoy the Tara Feis Irish Celebration at Emmet Park. This festive event begins at 11:00 A.M. and ends at 5:00 P.M. The family-friendly Feis will be a feast for the ears, eyes and palate! With live performances, delicious cuisine, crafts, fun games, and true Irish hospitality, the Tara Feis is the best way to celebrate St. Patrick’s Day in Savannah. The Feis features performances from Savannah Pipes and Drums, Glor na Daire Irish Dance School, McLean Avenue Band, Harry O’Donoghue and so many more talented artists. After enjoying the Tara Feis, head over to Tybee Island to participate in the Irish heritage Celebration Parade. The Parade starts at 3:00 P.M. on March 14th and winds around downtown Tybee Island. The Island will be decked out in green with a family-friendly parade featuring grand floats, marchers, and musical bands. The Irish heritage Parade is done in a unique and quirky way that only Tybee Island can do! Everyone is encouraged to dress in green in celebration! The Parade starts at the Tybee City Hall and proceeds down Butler Avenue! Come out and enjoy the festivities! Another way to celebrate the holiday is on River Street. The fun isn’t confined to just one day; River Street celebrates this holiday for a week. Filled with multiple stages of non-stop live entertainment, games, scrumptious food, cold beverages and so much more, St Patrick’s Day on River Street is a event you don’t want to miss! With so many different ways to celebrate St Patrick’s Day in Savannah, we hope you find the perfect one for you and your family. As you are planning your Savannah St. Patrick’s Day, do not forget to secure your reservation at the Presidents’ Quarters Inn. Any of our 16 luxurious rooms would make an excellent home away from home for a couple of nights. The Presidents’ Quarters Inn will serve you a complimentary Southern breakfast. Come stay with us for a true St. Patrick’s Day in Savannah!